I got a new digital camera last summer. During a month of traveling, I took a few bug pictures. 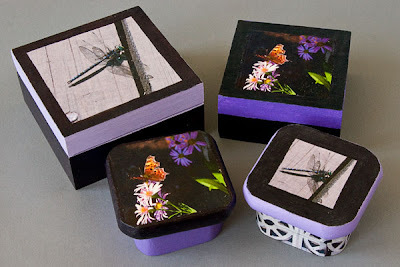 The dragonfly and butterfly on top of these boxes are transfer prints. You can see that I have several styles of boxes and I vary the sides depending on my mood. So these are my first bug boxes. Look for more in the future as I capture more buggy images.